Mike Upton and Rick Carlson from Kala Ukuleles have been invited by NAMM to participate in their Washington DC Fly-In as delegates to advocate music education in schools. 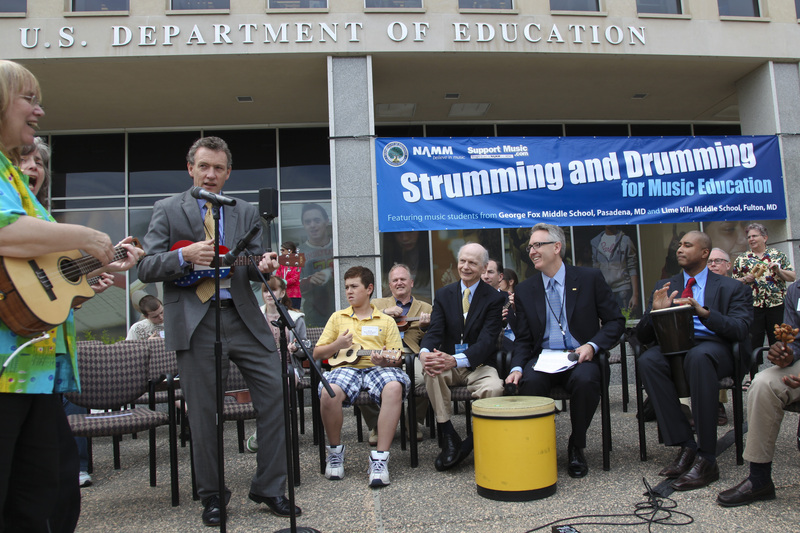 "Music education advocates will be meeting with members of Congress and the Senate and have been asked to participate in a drum and uke circle outside the Dept of Education bldg on Tuesday 10:30 am - "Strumming and Drumming for Music Education" -with VA area middle school students and Department of Education personnel. We have shipped 70 ukuleles for the occasion. The Secretary of Education Arne Duncan will be in attendance (Update: Assistant Secretary Peter Cunningham attended on his behalf) and we will present him with a red, white and blue Kala ukulele!" Read more about the event and the dignitaries who attended on the NAMM site. Posh tosh, Gary, not even in the same cool-universe as Kala's red, white, and blue Texas flag uke. Hey Mike, he plays, so why not gift George W. with one of these? And maybe it's just me, but it's high time ukers toned ourselves down a few notches. We are getting seriously up people's noses these days. This sort of gung-ho uke evangelism can be down-right embarrassing. Have you seen the first issue of Kamuke, Gary? Nice little thing, I very much prefer a paper magazine to reading a screen and I've never taken a fancy to the other one. Just finished Ukulele: The World's Friendliest Instrument (yes, I know). I'll just say it's every bit as good as Jumpin' Jim's book, you'll enjoy it, and even learn a few things. Although, I must be getting cranky because...At the end, the writer, Daniel Dixon, crosses over to the looney tunes' side and joins those who believe the ukulele possesses "some special and very potent spiritual powers." He finishes by saying, "...the writing of this book has converted me. Now I too believe that the belief is real, that the believers are true believers, and that their testimony can be trusted. 'Anyone who plays the ukulele can't be all bad.' Do you belive it too?" I don't understand what all these ukulele evangelists are going on about...? it's just a musical instrument, not a movement. but I do think politicians should not be allowed to play one. Or any instrument for that matter. They should just play with themselves.